A shopping we will go. A shopping we will go! Now that we are planning on life with a new baby, one of the things on my mind is figuring out how to get back into shape after the baby is born. My husband and I just returned from stroller shopping. I'm not sure if I'm thrilled or disappointed, but I think the decision we made five years ago will be the same decision we make again. The first time around at registering for baby gifts, we furiously waved that magic shopping wand around. Friends advised us to register for everything we could imagine because we might just get what we want. When seeking strollers, we chose the smart, lightweight "normal" stroller that everyone else got. It came with the car-seat and it probably folded up teeny-tiny enough to fit into a Mini Cooper with room to spare. But I knew this stroller would be too awkward and bumpy for my daily runs around the nearby lake. So the magic wand also captured the Jeep Liberty Limited 3 Wheel All Terrain Stroller by Kolcraft (currently $140 through Amazon). From my naive viewpoint, what impressed me most was that it had speakers near the top of the stroller so that I could enjoy good music without wearing earphones, which would prevent me from hearing if the baby had burst into tears. Or choked on a Cheerio. Then one day we went to the zoo with the stroller that didn't tout the ability for the car-seat to snap in. A long day it would be with nowhere for the baby to fall asleep, then stay asleep when transferred from the stroller to the car. So we attempted to snap the car-seat into the Jeep Liberty Stroller and (insert drum-roll) it fit! The stroller I thought would only work for running quickly took over all stroller duties. At 35.7 pounds, the Jeep Liberty Stroller is heavier than "lightweight" strollers that weigh around 23.5 pounds. But it still fits easily into the back of my Jeep Liberty SUV. (And let's face it. It's just plain cool to have a Jeep Liberty SUV and a Jeep Liberty Stroller!) As advertised, it folds easily with one hand, since the other hand is often holding the baby. Not only does the car-seat fit into it, the regular seat reclines so my son can enjoy the scenery while sitting up, or enjoy a rare nap while laying down. Both positions (and any position in-between) are protected by a safe 5-point harness. Changing positions seat positions is smooth, even with baby in the seat -- important when you want to slyly recline a baby who has fallen asleep. The Jeep Liberty Stroller has lots of cargo space. For at least three years the stroller replaced the car as our means to get to and from the grocery store. We asked the checkers at many stores if we could gather our groceries in our stroller instead of a cart. No problem! Several days worth of groceries fit, with extra room for diapers, wipes, hand sanitizer, toys, etc. On excursions with others, it easily fits shopping bags, coats, purses, toys, etc. This model does not have a handbrake like some more expensive ones do. But I've gotta say, I've never been in a position where I felt so out of control that I needed a handbrake. 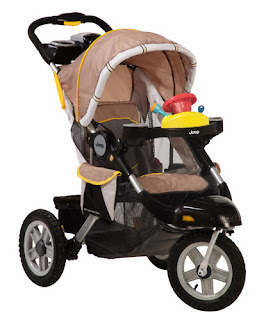 Likewise, it doesn't have the safety rope that connects the stroller to the runner's wrist in the event of a run-away stroller. We improvised with a short dog leash. The foot brake wore out after about 1 year and 750 miles, but one email to Kolcraft had me a new brake system in a few short days, along with a new seat that wasn't coffee stained (I mentioned the drink holders, right?) -- all for free. After test-driving 17 different models at 5 different stores, I'm sticking with the Jeep Liberty Limited 3 Wheel All Terrain Stroller by Kolcraft. Now the biggest question is whether to overhaul the 5 year old stroller with nearly 2,000 miles on it, or wave the magic wand and hope for a new one. I always coveted your Jeep Liberty stroller. It really helped you take care of yourself while taking care of your son. I'm not surprised you're gonna stick with a proven model. Was this all just a big hint for me to go buy you one? When my kids were young, my strollers made all of the difference in the world. It sounds like you have done great research and know exactly what you want. I LOVE MY JEEP LIBERTY stroller, too! I recommend buying it off craigslist. I got mine (in BEAUTIFUL condition) for $40. I see them on craigslist a lot for that price. No magic wand necessary, just a bit of searching!